The only sunlamp to get Vitamin D from UV light the natural way! 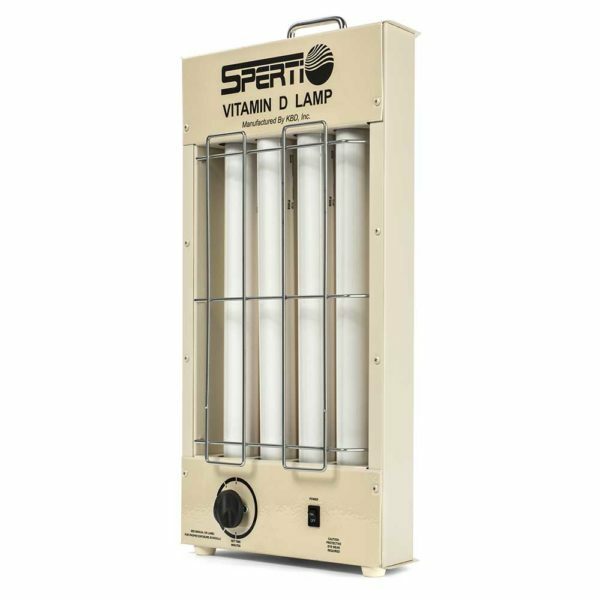 The Sperti Vitamin D Sunlamp, model D/UV-F, provides the special UVB rays that will generate Vitamin D naturally in your body. Our Vitamin D Lamp is the only FDA recognized ultraviolet product for Vitamin D production in the human body, and independent studies have verified it’s effectiveness. The portable Vitamin D Lamp is easy-to-use and a convenient way to get Vitamin D quickly and naturally. Adjustable timer for 1 – 5 minutes of use. Unit automatically shuts off when timer is finished. No assembly required. The bulbs are installed and ready-to-use. 4 special UVB bulbs with a 1000 hour bulb life. 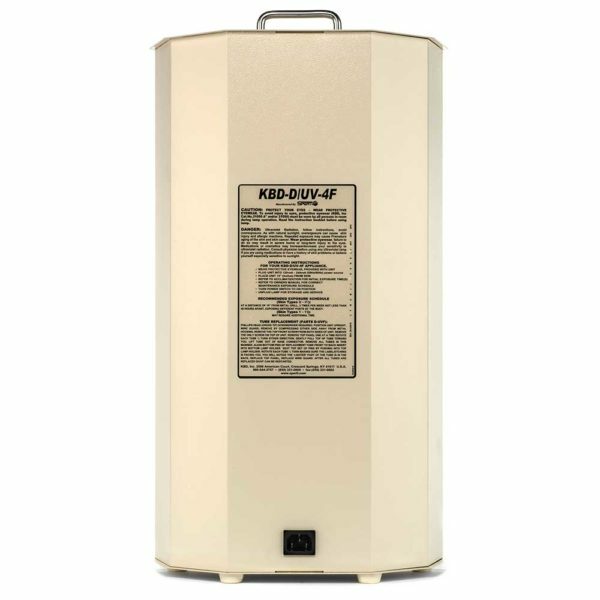 Built for dual voltage operations from 110-220 volts. No converter is required. Each box contains a US cord; however, if shipping internationally, we can include either a Euro cord, UK cord or Australian cord. Two pairs of UV blocking eyewear included with each sunlamp. Dimensions are 22″ x 12″ x 6″ and weighs 14 lbs. 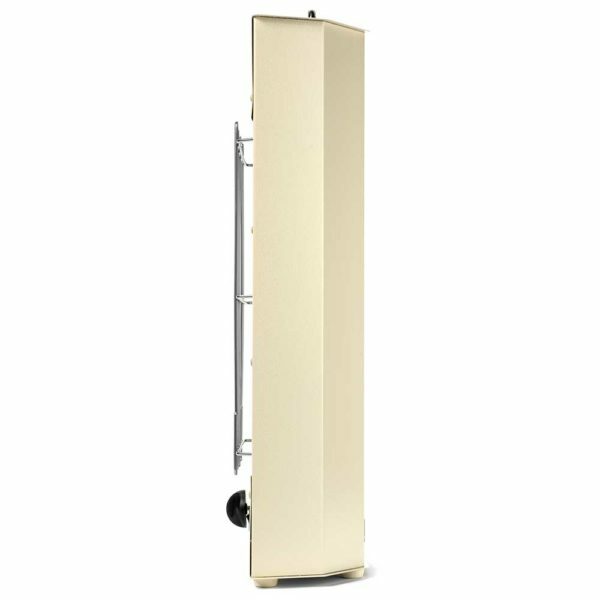 In conformance with FDA sunlamp regulations and has been FDA tested. Shipping note: UPS is our primary shipping method. Free Shipping for USA orders. Sales tax does not apply unless you reside in NV. Questions? All questions are welcome. Call us toll-free at 800-544-3757 (Pacific Standard Time). 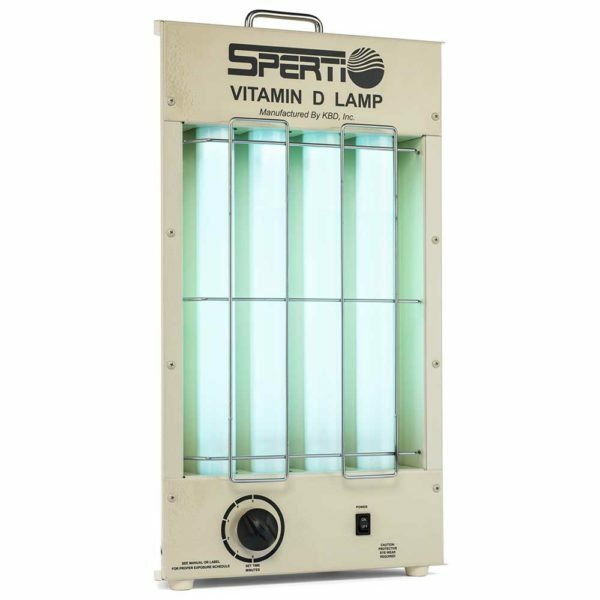 Product Warranty: We offer a full 7 year warranty on the Sperti Vitamin D Sunlamp and 6 months on the bulbs. We also offer a 60 Day Money Back Guarantee on all purchases. At age 40, after working indoors for 25 years, I accidentally discovered at a health fair that I was vitamin D deficient to the point that I had osteoporosis. I have a petite athletic build, exercise, calcium is fine. 50,000 toxic units of vitamin D didn’t return my levels to normal, but this lamp did! I’ve had it for over a year. No household should be without one (unless you live on the equator) – it is well worth the $. Vitamin D levels are now normal the natural way since I’ve had it. I’ve never been into tanning – this lamp doesn’t do that. I have a doctorate degree in science & find the medical research on this lamp impressive & compelling. I don’t feel like this lamp will be a significant factor for skin cancer or wrinkles, assuming it is used as directed. This lamp is very sturdy – my large clumsy dogs have knocked it over several times and it works perfectly. I plan to build a nook in my new house especially for it, since I will be using it for the rest of my healthier life. Your Vitamin D Lamp is the real deal. I did all my research and even read much of Dr. Holick’s Vitamin D research. One of my best purchases I’ve made for my health. Best Regards to you all. When its too hot outside! On sunny days I assist my elderly Mom out onto the back patio deck for some healthy sunshine time. We bought your Vitamin D Lamp last fall to get through the winter months but are still making use of it in June! On days when its too hot and uncomfortably outside for my Mom she can stay indoors and still get the benefits of outdoor sunshine time from your sunlamp. I gave you a 5 star review. Thank you. I am no longer Vitamin D deficient! Here’s the online review for my new Vitamin D Lamp. Thanks again. — I was confident it would work because I did my homework. Sunshine, uv rays, and Vitamin D, simple science. I prefer to get my Vitamin D naturally from the sun, and now I can also get it from your Vitamin D Lamp when I can’t get outside. Even though I was feeling great, I did indeed go back and have my Vitamin D levels tested again and I am back in the healthy zone. Tim in PA.
My new health & fitness device. When I moved from California up to Washington the change in sunshine was obvious to my body. I’m a health and fitness fanatic and I knew I needed to supplement my vitamin D due to this move. I avoid processed foods and artificial stuff, I want natural and healthy! My research on the web eventually led me to your UVB sunlamp product and I am very happy I found you. Your Vitamin D Lamp is now an essential tool in my health & fitness routine. Thank you!! I have a vit D deficiency, but have also deleveloped an allergy to vit D supplements! I’m so happy to have found Sperti! The sunlamp was a little larger than I expected, but it it easily tucked away when not in use. It has been the perfect alternative for me to get the vit D I need, but to not have to take supplements that make me sick. Thank you! Firstly, I was surprised on how quickly my lamp order was shipped and received seeing I was an out of country (Canada) customer. The product functions as advertised, without any problems. We have been using the lamp for about 6 years (winters only), and haven’t had the need to order replacement bulbs. Has our vitamin D levels risen as a result of the lamp? I really can’t answer that truthfully. I have no way of checking. I have put my total faith in Sperti to produce a product that does what it says it will do. The lamp is perfect for supplementing to maintain my Vitamin D levels safely without having to use a tanning bed or take high doses of drops. I live in the desert so when the sun is out most times it’s too hot to be outside (during the months my location even receives UVB rays)! So this lamp is great for letting me get UVB to allow my body to create its own Vitamin D on my skin and keep my healthy year round. Very happy with the product. Definitely noticing improvements with general wellbeing. The product itself is well built and engineered and customer support is great. Highly recommend. Your company deliver exactly what you said you would. I love the my Vitamin-D sun lamp. This is the only company to rely on for proper Vitamin D3 lamps. They have been in the business for a long time. I even bought spare lamps for my unit, so I am all ready for literally decades of use. 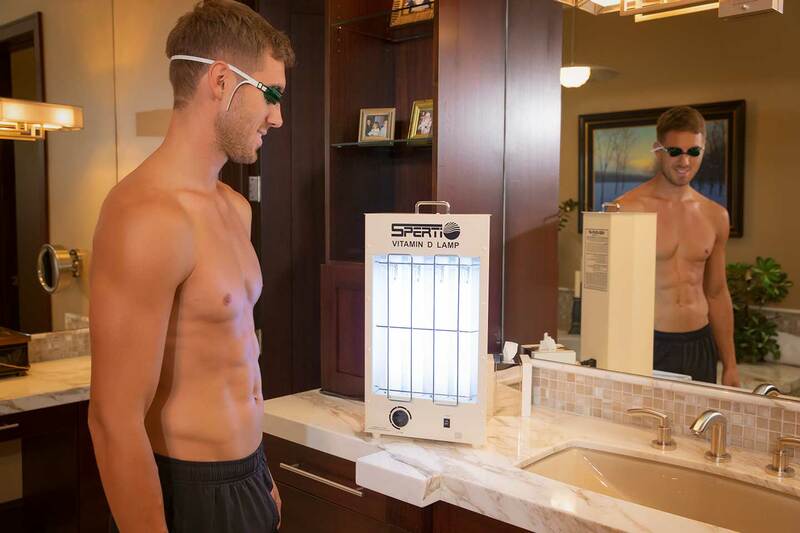 I ordered the Sperti sunlamp to increase my Vitamin D production, and am very satisfied with it. The sunlamp arrived quickly, and with very clear directions on how to use it. I sunburn easily, and the Sperti allows me to get enough UVB for Vitamin D production without getting a sunburn. Sperti Sunlamp down under: Purchased UVB lamp few months back to boost my Vitamin D levels. The online purchase was smooth and the support I received is excellent so far. Since I purchased the product with out actually seeing it – I was a bit apprehensive at first. However, quick response from the support team and the way they shipped the device with correct, high quality 230volt power cord was truly impressive. Most importantly, nothing was damaged during it’s long journey to the other side of the world. Performs as advertised. Built of solid, quality construction. 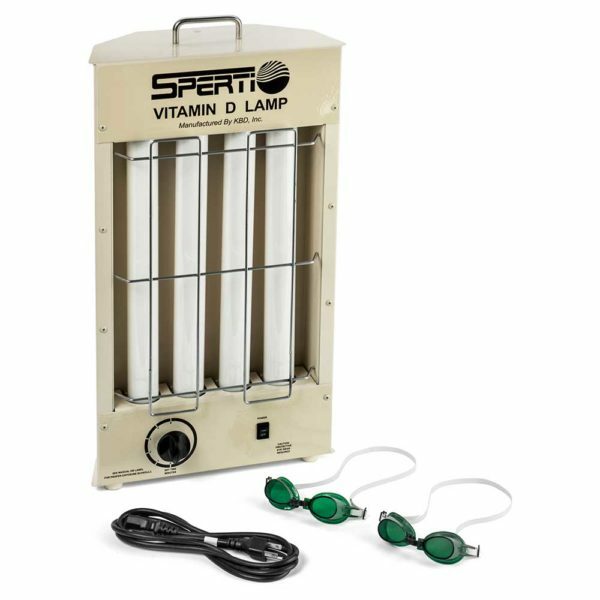 This is an excellent product Sperti Vitamin D Light Box and an extra set of 4 bulbs! The dispatch and shipping to Sweden was very fast. I highly recommend SPERTI.com! 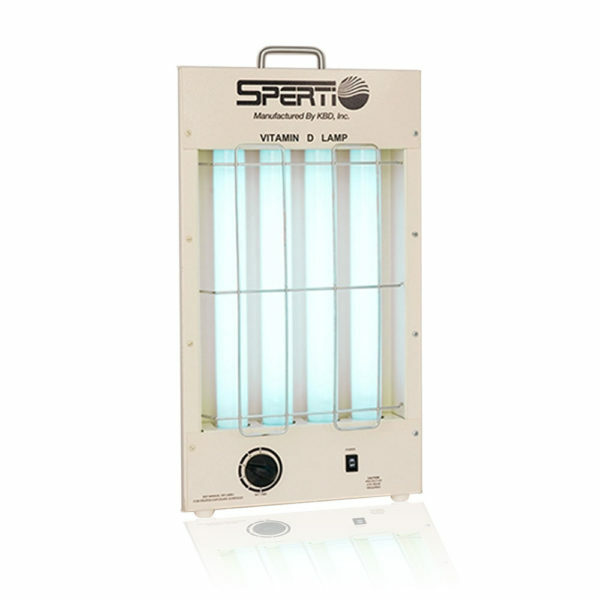 The unit is particularly useful for people with low vitamin d Good during the winter months, go with sperti UVB lamp a robust and effective product you cannot go wrong. Great customer service, and my sunlamp works exactly how it’s supposed to! Sperti gave a fair price for an excellent product and their customer support has been very helpful when I had questions. The best way to get Vitamin D in the northern part of the country. Excellent, solid, high-quality product that I use near daily. Wouldn’t be without it! This is a great machine especially for my wife who has an allergy to vitaminD supplement. It does not fulfill her total need for vitaminD but goes a long way. We have had zero trouble with the machine. I bought 4 sunlamps and I have been very satisfied with our purchase (delivery as well as daily use). 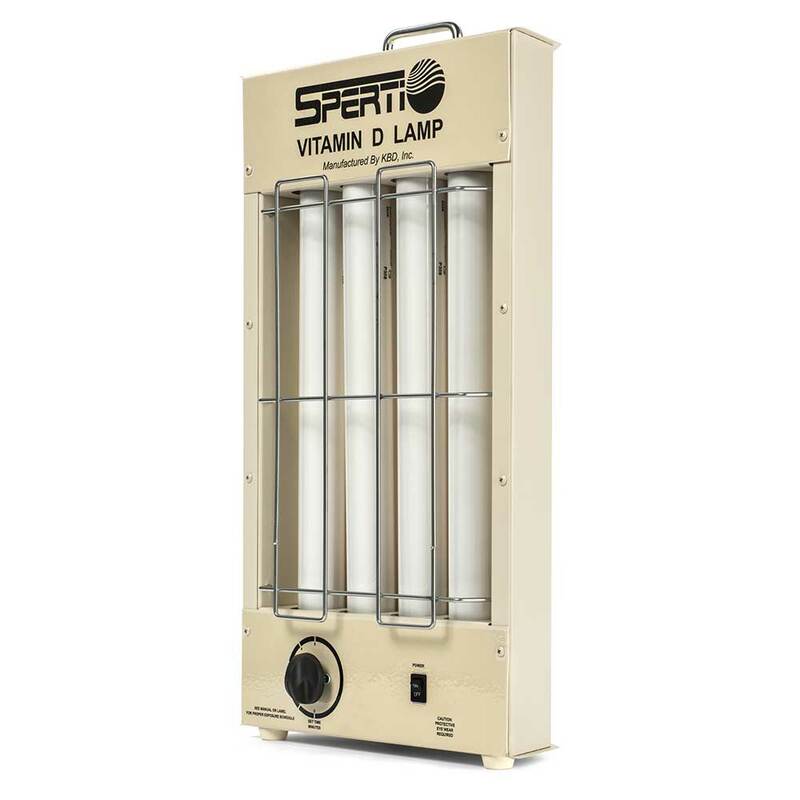 I am pleasantly surprised with my Sperti Vitamin D lamp! I purchased it Jan 2018 and used it 5 min/day for 3 months. I had my Vit D tested prior to beginning and it was 37. After 3 months it had fallen to 32. My doctor recommended I start using it for 20 min/day. I only managed to work in 10 min/day for the next 3 months (April-June). I had my D tested again after that and it had risen to 46. I take no supplements, I get VERY minimal sun. I eat no vitamin d enriched foods. I credit the lamp to raising my D levels very nicely. I will continue to use it faithfully. In the past I have tried just about every D supplement there is and have never been able to tolerate any of them! This was my last ditch attempt to do something about my D levels since nothing else worked. I highly recommend the Vitamin D lamp! Good quality sunlamp! Good quality sunlamp, very easy to use and does not take up a lot of space! Just as important to use in the summer as in the winter for people who might be heat intolerant as I am and cannot go out in the sun very often. I try to use it 2-3 times per week as my Vitamin D levels are quite low, even though I take supplements. An indispensable tool for the long winters where I live. Very happy with my purchase! Very good product, with excellent customer service. The product is built very well and will last a long time. I have used this product and works very good for what it was made for. I can feel it does the job and is working. Makes me feel great all winter long when I can’t get enough sunshine. So far so good, thankful this product. Follow the directions about the amount of time under the sun as well as a very small amount of maintenance. I stopped taking vitamin d to see if this light really helps – it did! By the way: i do 4x 5 minutes (2 upper and lower front, 2 upper and lower back). Good luck with it! The Vitamin D lamp is very solid, obviously well made and of the highest quality. I’m confident it will serve me a long time. Been having trouble with Vitamin D and this helped tremendously. Had multiple blood tests with low vitamin D levels and regular vitamin D supplements did not seem to be working. My doctor suggested mega vitamin D supplements. My wife searched for another alternative and found the Sperti Vitamin D lamp to try. I used it about 4-5 times a week and within 6 months my D levels increased significantly in the next test and I did not have to think about taking supplements. This definitely works. The Vitamin D box arrived quickly. I wasn’t sure if I had entered my shipping address correctly so I emailed the office. I got a quick reply and the box was delivered to the correct address. Very pleased with the purchase. This product provides me with the vitamin D i need that I can’t get from my diet due to IBS. I recommend the Sperti Sunlamp to anyone with MS living in the North as a supplement. We live in a very rainy climate during the winter months and this product is fantastic!!! You only need 5 minutes a day to make yourself feel like your sitting on a beach. Just close your eyes and pretend. My wife really suffers from the winter time blues due to weather and this helps her tremendously!!! Quick Shipping and I’m VERY satisfied with my purchase! Quality product. Delivered fast. No complaints. This lamp has been a lifesaver during the winter months. I needed a way to get vitamin D as I am unable to take it in pill form. With a busy schedule I can use the lamp from the comfort of my home very quickly. The Sperti lamp is a high quality product. It’s made very well, with sturdy parts that won’t break. The design is well thought out. It’s a compact lamp and easy to use and store. Customer service is top notch and the staff is very knowledgeable. I have owned my Sperti for over a year now and I am very pleased with it. I like having an option of getting vitamin D through the fall, winter and spring in SW WI. I love it. Short and sweet. I have now bought two, and will likely soon get a third. I have one in my office for all clients to use when they arrive. It fives them a nice boost of energy for appointments, even after a long day of work. I’ve even used it for a rescued crested gecko with Failure to Thrive. (Yes, you read that correctly.) She’d gone 4 months without gaining anything, but with a few minutes of light a week she’s gained 33% of her body weight!